Visine has unfortunately always been the “go to” eye drop for treating any red eye condition without any proper medical diagnosis as to why the eyes are red. The “take the red out” branding has been very effective in making Visine a common product in many medicine cabinets. Visine works by temporarily taking narrowing blood vessels on the surface of the eyes which results in a whiter appearing sclera. However, the medication (tetrahydrozoline) which make the eyes white and the preservatives in the eyedrop itself further irritate the eye resulting in a rebound effect in which the eye becomes even more red after the whitening effect wear off. Also, with repeated use, the surface blood vessels become accustomed to Visine, resulting in the whitening effect becoming less and less with each use and the patient using more and more of the product. Lumify works in a similar fashion as Visine in that it is a blood vessel constrictor but selectively targets certain receptors on the blood vessels resulting in a far less rebound effect. Lumify’s active ingredient is low dose brimonidine which is a glaucoma treatment that has been safely used to lower eye pressure for decades. Its eye whitening effects were an accidental positive side effect and it is surprising that the manufacturer (Bausch and Lomb) did not bring it to the market as an eye whitening agent sooner. Here is the caution with any eye whitening agent: They usually do little to treat the underlying condition that made the eye red in the first place and can temporarily make a sick eye look better which will often delay proper diagnosis and treatment of the underlying problem. Conjunctivitis (pink eye), dry eye, Iritis, and many other eye problems leading to red eyes will often look better with any eye whitening treatment but do little to treat the true medical condition. 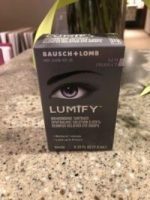 Lumify can be a very effective eye whitening agent but should only be used as an additional therapy to the treatment of the problem causing the red eyes. Please contact us for an evaluation of your red eyes. Once we have determined that no underlying medical condition exists, Lumify can be a great way to safely whiten your eyes and we currently carry Lumify in our office. Please make an appointment at our clinic to see if Dr. Steve believes you would be a good candidate for Lumify eye whitening drops.